The journey of life from the single cell zygote to an individual made up of trillions of cells is attained by continuous division of cells, called mitosis. Think; if an error in genetic material occurs any time during these divisions, the result may be disastrous. As you know, all the cells after that faulty cell carry the damage and as a whole for an organism it would be fatal. But generally that never happens even in blue whale or red wood tree which is made up of trillions followed by many zeros of cells. The fidelity and the correctness of the process is astonishing and I could not site a similar process with such precision in an artificial condition. In this post we will discuss how this is achieved? Rudolph Virchow put forward the third tenet of cell theory all cells arise from pre-existing cells. This was a very important at that time as theory of spontaneous generation was widely accepted. The process by which new cells arise from existing cells is called cell division. The process cell division resumes throughout life time. The cells of our bone barrow, intestinal tract and skin cells all undergo division in every second and these cells has short life span and should be continuously replaced. Our post on cell differentiation will give you a good idea about different types of cells based on their capability of division. Cell cycle is the history of a cell or the stages through which it passes from one division to other. 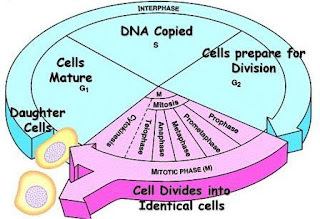 Inside the body or in cell cultures cells passes through series of defined stages called cell cycle. This distinction into different stages is based on the observation of cellular activities under light microscope. Cell cycle can be broadly classified into M phase or mitotic phase that includes mitosis, cytokinesis and Interphase. Interphase is the period between cell divisions and it is the preparatory phase before mitosis. It consists of G1 (gap 1), S (synthesis phase, called so as DNA synthesis takes place during this stage) and G2 (gap 2 phase). In G1 phase, the cell grows and prepares for cell division, DNA synthesis takes place in S phase and in G2 phase the cells grows and further prepares for mitosis. Some cells enter a resting stage called as G0 phase. It is a stable state and cell size remains constant. Before moving into the details, here is the approximate duration of different stages in mammalian cells G1 ~10h, S ~9h, and G2 ~4h. Remember, I found this as a question in many exams. G1 phase is the longest phase. Now I just want to tell you the importance of cell division. If anything wrong happens during the preparatory phase of a single cell then all cells arising from that cell will be having this mistake ultimately resulting in a population or clone of cells with the same error. Some times this can be disastrous as in the case of cancer. Cancer begins with DNA mutation that happened in a single cell but unfortunately passed to all the progeny cells originated from that cell. But as I mentioned thousands of cells are dividing every second and cells should have some mechanism to rectify or prevent mistakes that occur during preparatory phase. Of course, the mechanism is awesome and its ability to prevent mistakes is tremendous. That is why we are not getting any fatal diseases even though many cells are undergoing continuous division. How cell cycle is regulated? How this is achieved? The progression of cells through different stages of interphase namely G1, S and G2 is tightly controlled. There are two check points G1-S (regulating cell progression from G1 to S) and G2M (regulating cell progression from G2 to M) just like check post at the borders. These check points will look for any error basically in the genetic material (DNA) and will not allow the cells to progress until the error is rectified.